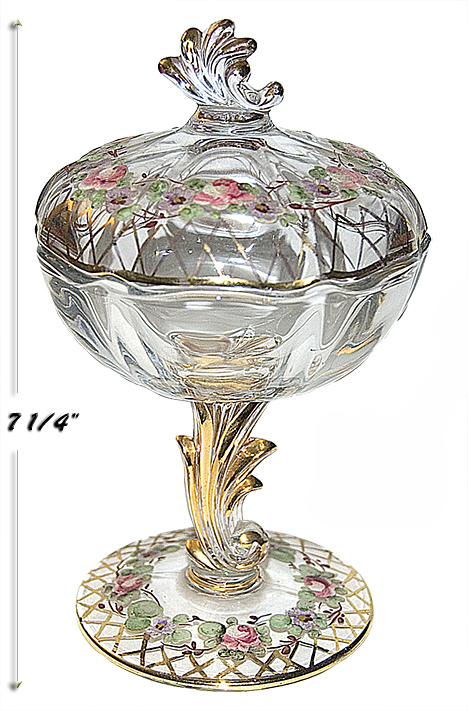 Condition: This beautiful jelly / candy dish in the Baroque pattern is in Undamaged Condition without chips, cracks, or mold damage. The Charleton decoration was added by Ables, Wasserberg and Co. They bought the Baroque blank, decorated the piece and sold it under the Charleton label. The decoration is intact and is in good shape with only minimal, if any, wear. Company Owner: Abels, Wasserberg & Co.
Abels, Wasserberg & Co. (AWCO) (1943 - 1967) - Abels, Wasserberg & Company is today, largely known as a quality decorating company. Mark Palmer, probably the most knowledgeable and well known author on Abels and Wasserberg refers to the company as a, "premier decorating and lighting company." Abels and Wasserberg began using the Charleton trade name in 1943. This innovative company did not make their own glassware, china, or pottery. Instead, they bought glass and fine china made by other companies. In the early years most of their purchases were imports. Later, they purchased most of their glassware from the United States. They decorated these pieces with their own creative designs and sold them under their Charleton label. 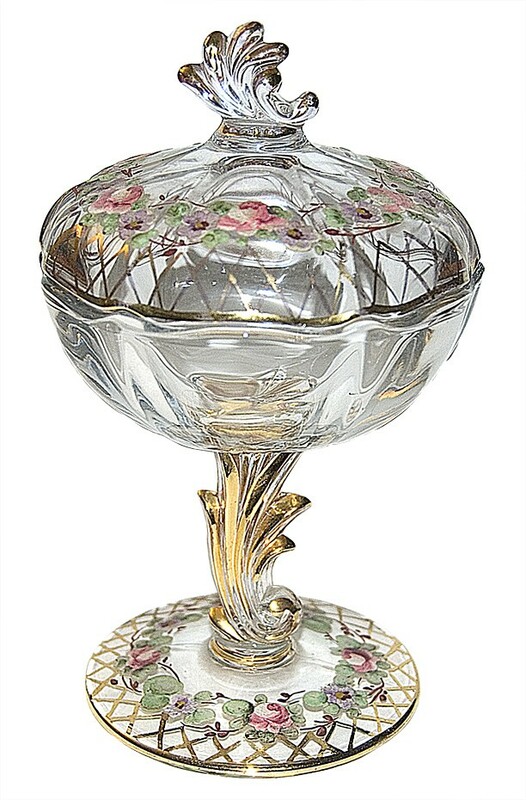 Abels and Wasserberg purchased glassware from many companies including Cambridge, Consolidated, Duncan & Miller, Fenton, Fostoria, Heisey, Imperial, Westmoreland, West Virginia Glass Specialty, and other glass houses. Wasserberg and Company filed for bankruptcy in 1967. At that time their inventory and their trademark were obtained by the Beth Weissman Company. We are concerned with pieces that were made from the late 1940s to the 1960s. For a more complete in-depth look at this fantastic company we encourage you to purchase Mark and Lori Palmer's book "The Charleton Line". Baroque - Baroque was introduced in 1936. Azure Blue was made from 1936-1944; Topaz from 1936-1938; Gold Tint 1938-1944, and Ruby from 1936-1939. Items in crystal were made until the Fostoria plant closed in the 1980's.